Summertime is the perfect season for hosting a barbecue, going on a picnic, or grilling outside with friends and family. 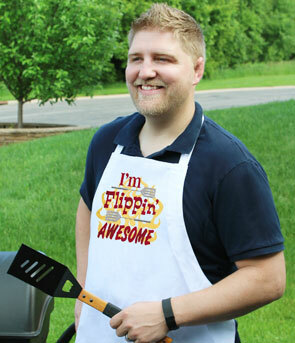 Stitch for your favorite grill master or mistress with these fiery designs! 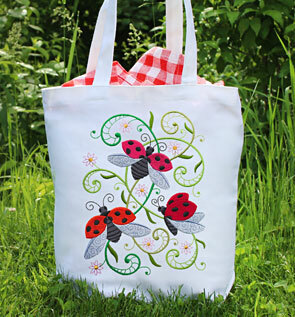 Whimsical ladybugs land on a wide variety of projects, while adorable picnicking animals make the perfect quilt or outdoor blanket. 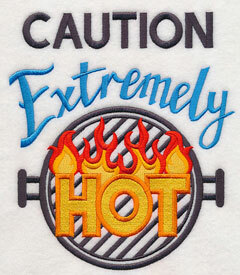 Grill aprons, towels, and casserole covers get a burst of personality with barbecue sayings and samplers. 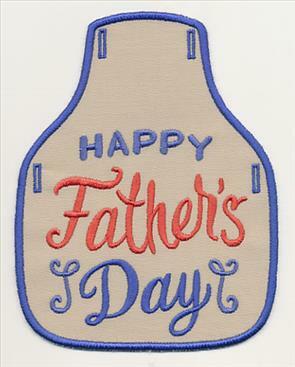 Plus, new applique designs, Father's Day bottle aprons, and more! Scroll down the page to see all of these hot new designs! Instead of a basket, use a tote bag to carry all your picnicking needs. 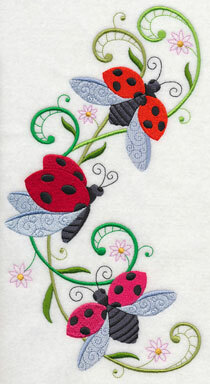 Let sweet red and black ladybugs shine on your next embroidery project! Elegant swirls, delicate flowers, and leaves in shades of green add fun appeal to these whimsical wings. 6.89" x 9.24" and 5.86" x 7.86"
6.27" x 11.76" and 5.01" x 9.39"
4.16" x 7.80" and 3.66" x 6.85"
Stitch this ladybug potpourri on a quilt, set of pillows, tea towels, and more. 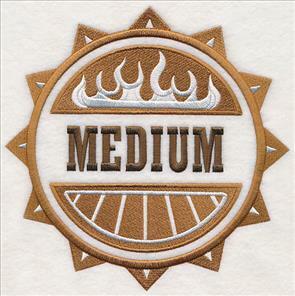 The open areas and mix of stitch types bring layers of depth and texture to your embroidery. 11.74" x 4.61" and 9.39" x 3.69" and 7.79" x 3.06" and 6.00" x 2.52"
A corner design is perfect for updating a pocket or napkin -- or repeat it creatively on a pillow or placemat! 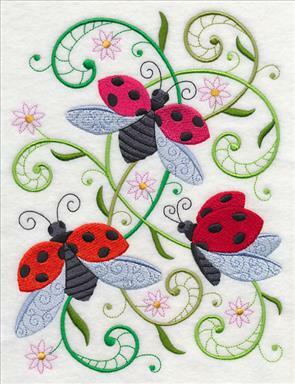 Two single ladybugs are delightful coordinating designs. 5.87" x 5.87" and 4.88" x 4.87"
3.85" x 3.06" and 2.48" x 1.98"
Choose your favorite ladybug designs, and add them to your basket by using the links above. Or, get the whole selection in a design pack! 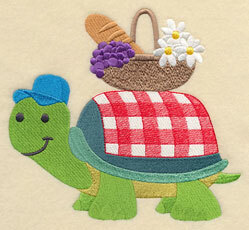 Terrific on quilts, garden gear, and more. 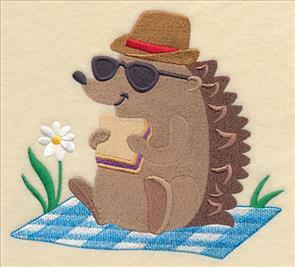 Create a quilt full of your favorite animals with these picnicking pals! 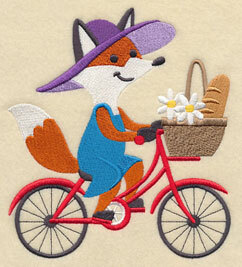 A fox heads to meet her friends on her bright red bike; a too-cool hedgehog starts digging in. 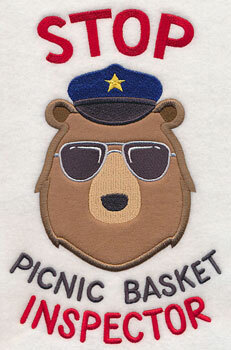 Also fabulous on kids' gear, picnic blankets, tote bags, and more. 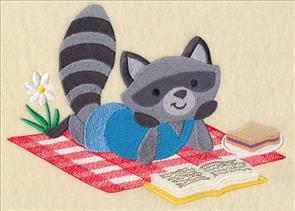 A reading raccoon stretches out on his picnic blanket to finish his favorite story, while his turtle friend balances the picnic basket on his shell. These summertime cuties are terrific additions to any picnic gear! 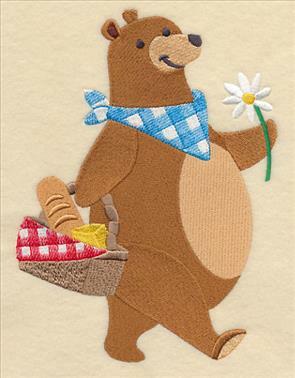 6.48" x 5.86" and 5.37" x 4.85" and 3.86" x 3.49"
A charming bear and soaring owl bring more supplies to the outdoor feast. Stitch all six designs in one project, or pick your favorite to stitch alone. 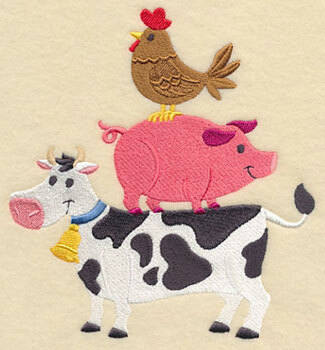 5.85" x 7.56" and 4.85" x 6.26" and 2.98" x 3.86"
These picnic animals are adorable on any project. Add them to your basket by using the links above. Or, get the whole group in a design pack. 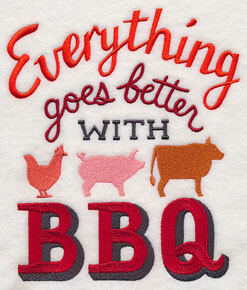 Get fired up to start off barbecue season with these fun sayings and samplers. 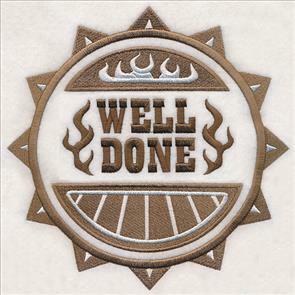 Stitch "Everything goes better with BBQ" on grill aprons and towels; "BBQ" with a kabob laurel is the perfect addition to placemats, sweatshirts, and more. 6.73" x 7.81" and 5.86" x 6.80"
6.11" x 5.85" and 5.06" x 4.85"
Your favorite griller will get a kick out of these smokin' hot designs! 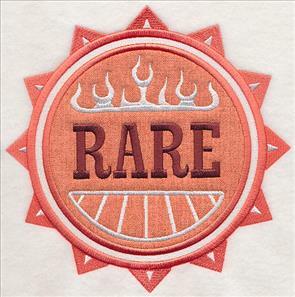 Fun and colorful motifs for any gift, including grill towels, aprons, and shirts. 6.84" x 7.80" and 5.87" x 6.69"
7.46" x 6.85" and 6.38" x 5.86"
5.29" x 4.86" and 3.87" x 3.55"
It's summertime, and the living is easy! 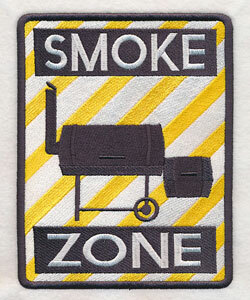 Show off your plans to grill and chill in the warm weather with this simple saying, or mark the "Smoke Zone" in a framed piece or on an apron. 7.81" x 6.79" and 6.74" x 5.86"
5.86" x 7.45" and 4.86" x 6.18" and 3.04" x 3.86"
A casserole cover or reusable shopping bag is the perfect place to let these fiery designs shine! 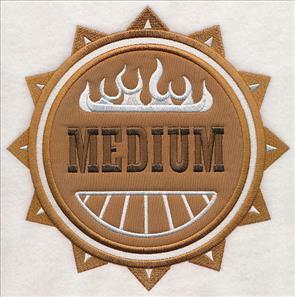 Classic condiments adorn the "Let's Eat" motif, while this "Get Your Grill On" design is modeled after a steak branding iron. 7.81" x 6.80" and 6.73" x 5.86"
6.90" x 7.42" and 5.85" x 6.29"
4.85" x 5.21" and 3.60" x 3.86"
Pick your favorite from these "flippin' awesome" designs, and stitch a gift for your favorite griller. 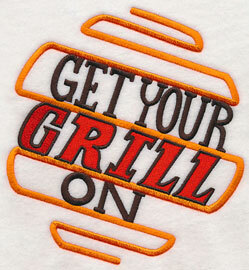 To learn how to embroider on grill towels, visit this video tutorial, or the coordinating written tutorial. 6.31" x 7.80" and 5.80" x 7.18"
4.86" x 6.00" and 4.07" x 5.02"
5.85" x 6.08" and 4.83" x 5.02"
Show off your grill skills with an apron that's full of personality! 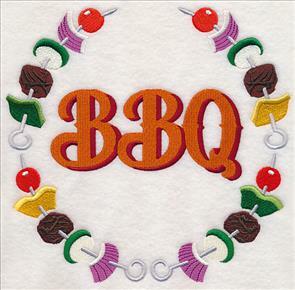 Any barbecue crackerjack will smile when they see this fun embroidery project. 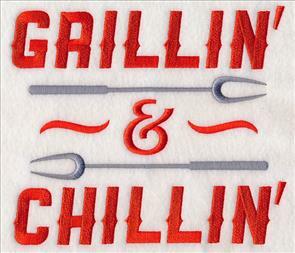 Pick one of these BBQ designs, then stitch for your favorite grill expert. 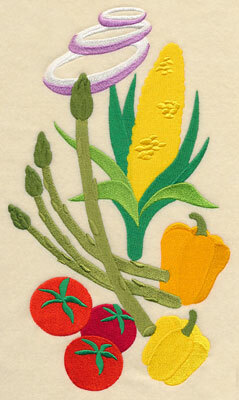 See all our apron projects on the Embroidery Library project website here. 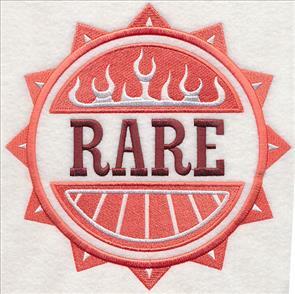 Get stacks on stacks of classic grilling elements with these designs. 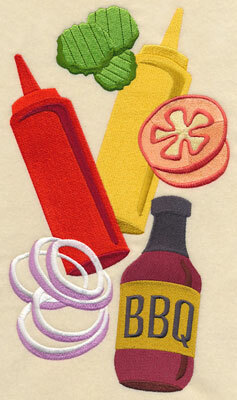 Traditional burger and barbecue condiments fill the motif on the left; delicious veggies make up the tasty stack on the right. 6.84" x 11.75" and 5.48" x 9.41"
4.55" x 7.81" and 4.00" x 6.86"
6.82" x 11.75" and 5.47" x 9.41"
4.54" x 7.81" and 3.99" x 6.86"
Embroider your favorite farm friends on tea towels, tote bags, wall hangings, and more. A fun addition to a wide variety of projects! 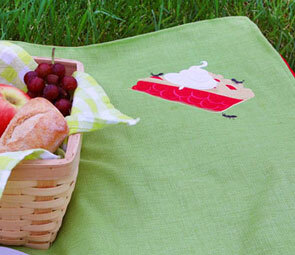 5.86" x 6.34" and 4.87" x 5.27" and 3.57" x 3.86"
Stitch a summertime picnic with these cute, light-hearted designs. 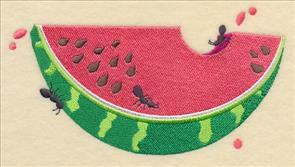 Each of the picnic food favorites are being taste-tested by adorable ants. 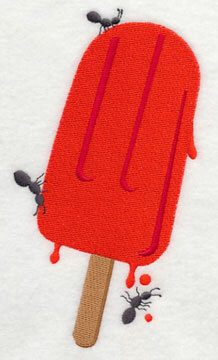 The ants are on a separate color stop, and can be left off if desired. 6.54" x 4.54" and 3.85" x 2.68"
An ice cream cone and popsicle are cool and refreshing on any hot summer day. 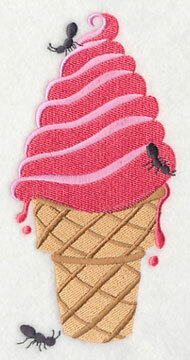 Add the sweet treats to a quilt, picnic blanket, tote bag, or tea towel. 3.72" x 6.85" and 2.09" x 3.86"
A grab-and-go travel blanket is the ultimate summer essential. No picnic, parade, or trip the park is complete without it! Not only is this travel blanket water-resistant, making it the perfect way to stay dry on damp grass, but when your activities are finished, it folds easily (and has a handy carrying strap!). Keep this travel blanket on hand for all your summer festivities! See how to make it in this free tutorial. Finish off this set of favorite summertime foods with a grilling kabob and sweet, juicy grapes! 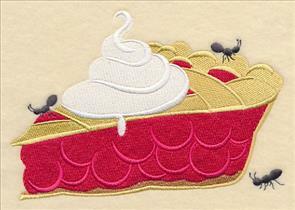 Delicious on aprons, towels, table linens, and picnic linens. 6.81" x 4.70" and 3.87" x 2.67"
Choose your favorite foods from the picnic basket above, and add them to your basket. Or, get the whole collection in a design pack. Like your steak rare, medium, or well done? 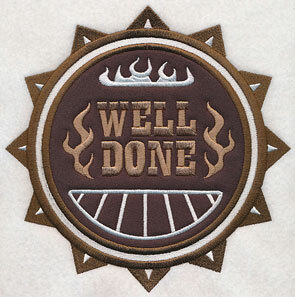 Show off your favorite degree of doneness with these grilling stamps. 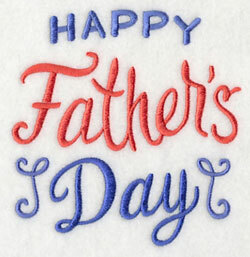 Each come in two versions: stitch-filled and applique. Find helpful tips and tricks for embroidering applique designs in the project tutorial here, or in the video tutorial here. 5.84" x 5.83" and 4.85" x 4.84"
If stitching the applique versions, pick favorite fabrics to add unique style and personality to the designs. 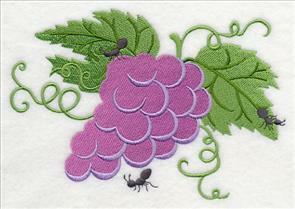 For more information on applique embroidery, reference this free project tutorial, or this YouTube video. 7.78" x 7.77" and 6.88" x 6.87"
5.84" x 5.83" and 4.86" x 4.86"
Stitch all three -- rare, medium, and well done -- to show the varying gradations of doneness. As the meat gets darker, so do the colors of the stamps. 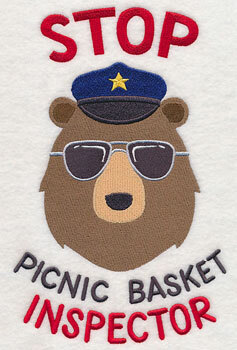 Don't forget to get your picnic basket checked out by this inspector! A fun (and funny!) addition to picnic bags, blankets, and more. 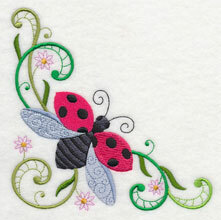 This design is available in both stitch-filled and applique versions. 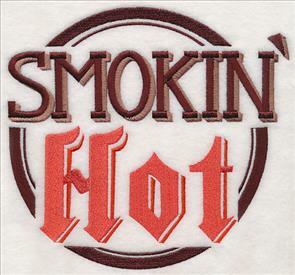 5.83" x 9.21" and 4.35" x 6.87" and 2.51" x 3.89"
Simple typography with fiery details give these applique words a subtle, yet eye-catching look. 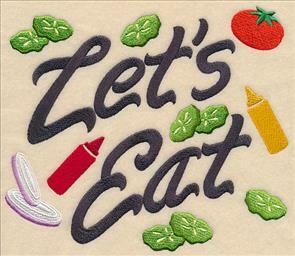 Get more information on applique embroidery in this free project tutorial, or the YouTube video. 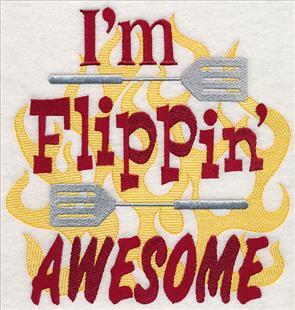 10.97" x 4.90" and 9.38" x 4.19" and 7.79" x 3.48" and 6.87" x 3.07" and 3.90" x 1.77"
Adorn these barbecue words on a gift for your favorite griller. 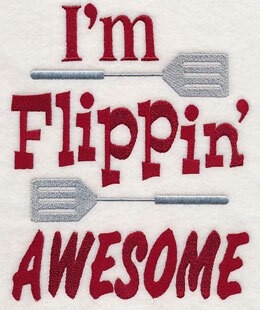 Great on aprons, pot holders, casserole covers, and more! 10.98" x 4.91" and 9.38" x 4.19" and 7.79" x 3.48" and 6.87" x 3.07" and 3.90" x 1.77"
This "BBQ" design uses multiple pieces of fabric for a bright and colorful look. 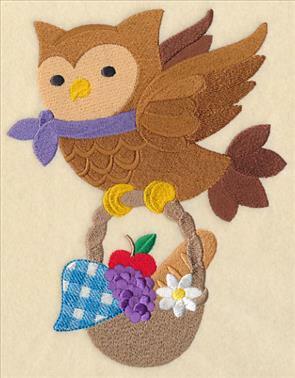 Find more information on multi-piece applique in this fun video, and this helpful tutorial. 11.75" x 4.80" and 9.41" x 3.85" and 7.81" x 3.20" and 6.87" x 2.81" and 3.90" x 1.63"
If your dad (or husband, brother, friend, son, grandpa, uncle) is an avid barbecuer, he'll love this grilling bottle apron! Terrific for adorning bottles of beer, dish soap, olive oil, and more. 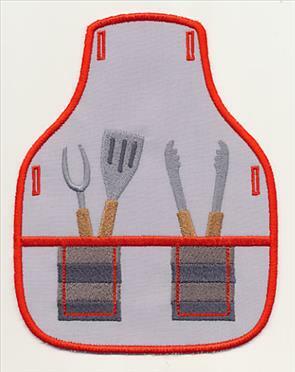 Click here to find the helpful tutorial on stitching in-the-hoop bottle aprons. 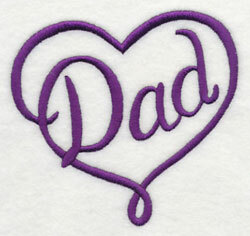 You wished Mom a Happy Mother's Day, now it's time for Dad's turn in the spotlight! 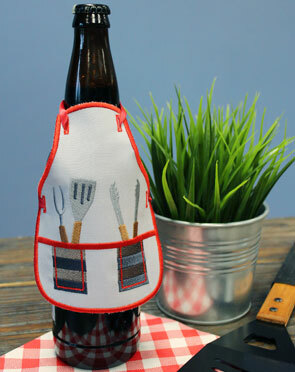 Stitch this bottle apron and coordinating separation for a fun gift set. 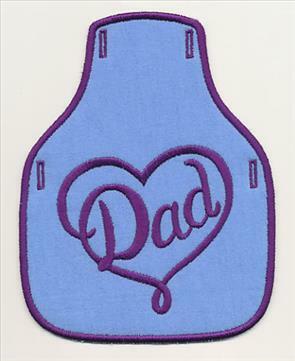 4.86" x 5.02" and 3.67" x 3.80"
This Father's Day bottle apron coordinates beautifully with the Mom Heart Bottle Apron. 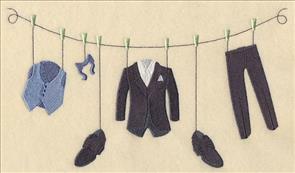 Make a matching set for anniversaries or as a special surprise. Find helpful instructions for making bottle aprons here. 5.09" x 4.86" and 3.86" x 3.69"
It's wedding season! 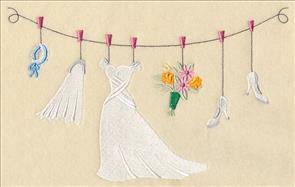 Linda requested coordinating bride and groom clotheslines, and they're terrific for adorning fabric gift bags, towel sets, t-shirts, and more. Give to your favorite couple on their special day! Thanks for the suggestion, Linda. 9.40" x 6.65" and 7.80" x 5.52" and 6.85" x 4.85"